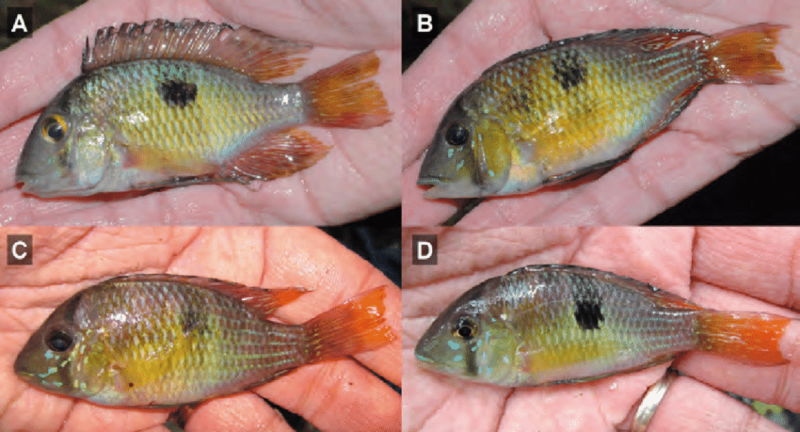 From the paper: Gymnogeophagus taroba, coloration of live specimens immediately after capture. (A-B) IBIGEO-I 449, paratype specimens, 87.8 mm, 79.8 mm. (C-D) MLP uncat., Říčan et al., February 2014, data as holotype. According to the recent paper authored by Jorge Casciotta, Adriana Almirón, Lubomír Piálek and Oldřich Říčan, the newest member of the Gymnogeophagus setequedas species complex, G. taroba, is best differentiated from its relatives through color patterning. Dorsal fin coloration is the easiest key to distinguishing the species: in G. taroba the spiny dorsal lacks all patterning, while only the rear portion of the spiny dorsal has patterning in G. setequedas, and G. che displays wide white bands throughout the spiny dorsal. From the paper: Distribution of the G. setequedas group in Middle Paraná river basin. Colored localities show the distribution of the G. setequedas group and material examined in the present study. Stars show type localities. Red: G. taroba, green: G. setequedas and violet: G. che. 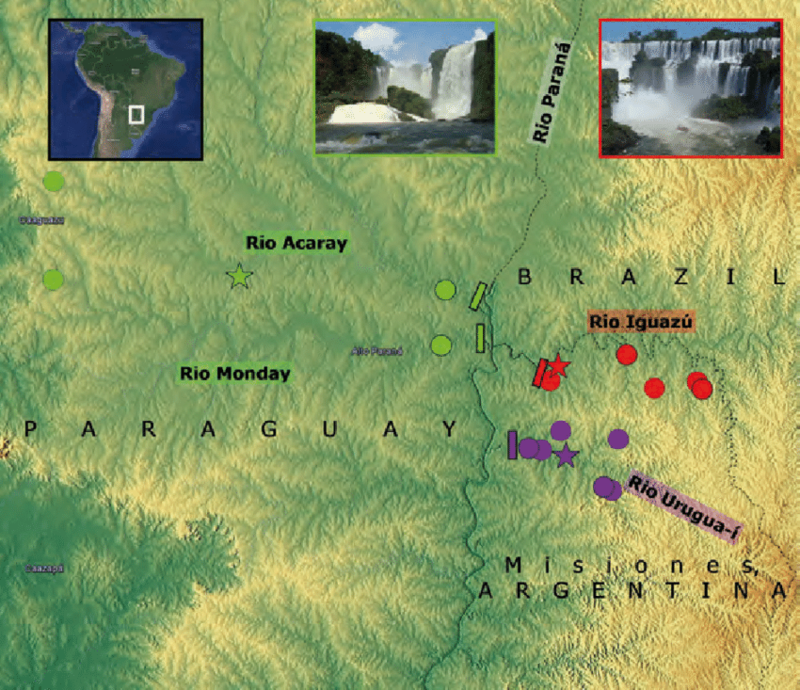 Inset photos show two of the major waterfalls in the area (Cataratas del Iguazú, Salto Monday) and location of the study area within South America. The paper’s authors report that all three species are “found in a wide variety of habitats and are common species of cichlids.” In reviewing the paper, it seems that slow-moving or still bodies of water with sandy or muddy substrates are the preferred habitats for these sister species. The full paper and species description, with many more images (including the sister species Gymnogeophagus setequedas and G. che) and thorough discussion, is available online at ResearchGate.net. Read Gymnogeophagus taroba (Teleostei: Cichlidae), a new species from the río Iguazú basin. Casciotta, Jorge & Almirón, Adriana & Piálek, Lubomír & Říčan, Oldřich. (2017). Gymnogeophagus taroba (Teleostei: Cichlidae), a new species from the río Iguazú basin, Misiones, Argentina. Historia Natural 326-1778. 7. 2017.